We will continuously try to improve our professional services. Now, we would like to wish you a merry Christmas and a happy new year. Please note that we will be closed from 24th December 2015 until 3rd January 2016.
you as soon as possible but it may take for a while to respond all of the e-mails. Please wait patiently. Again, we wish you all a merry Christmas and a happy new year!! 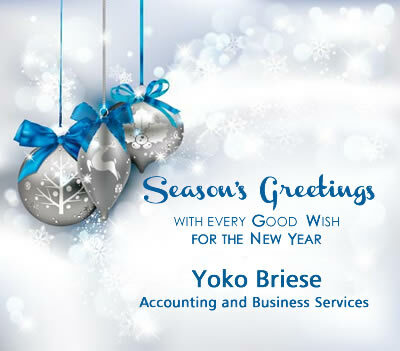 From Yoko and all staffs from Yoko Briese Accounting and Business Services.